Vance wanted a Super Mario party. Alrighty then, game on. I made them on my computer, printed them, and sent them out. These were inspired by others I had seen online. Here's where I discover that it's hard to find Mario party supplies. I talked to a manager at the party store and she tells me that it's due to licensing. She's hoping that they start getting more stuff in a month or so. That's no help to me as I need it now. I can order Mario party stuff online but am worried about getting it on time and don't want to pay a ton of money. Once again, game on. I'm a crafty lady. I can do this. 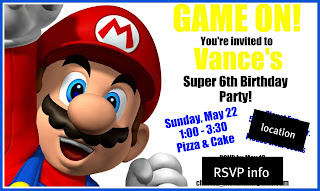 Come to grips that having Mario plates, napkins, cups, and etc. are really just for me - the kids won't care. It seemed silly to spend money on things that ultimately get thrown away and where we were having the party provided everything to begin with. I still wanted the party room to look exciting for when the kids came in. A red table cloth comes standard so I made the following to scatter on top. I found a coloring sheet online then "colored" it in using my computer. I had them printed on cardstock at our local Office Max. I don't have a picture of them on the table, but they looked cute and stood out against the red table cloth. I also brought along a balloon bouquet of primary colors since, again, I couldn't find any Mario mylar balloons. There were a million different ways to go with this one. I saw the idea for the Game Over! card online and new I wanted to incorporate that somewhere. I used the basic idea for the invite just switched the wording and again had them printed on cardstock at Office Max. 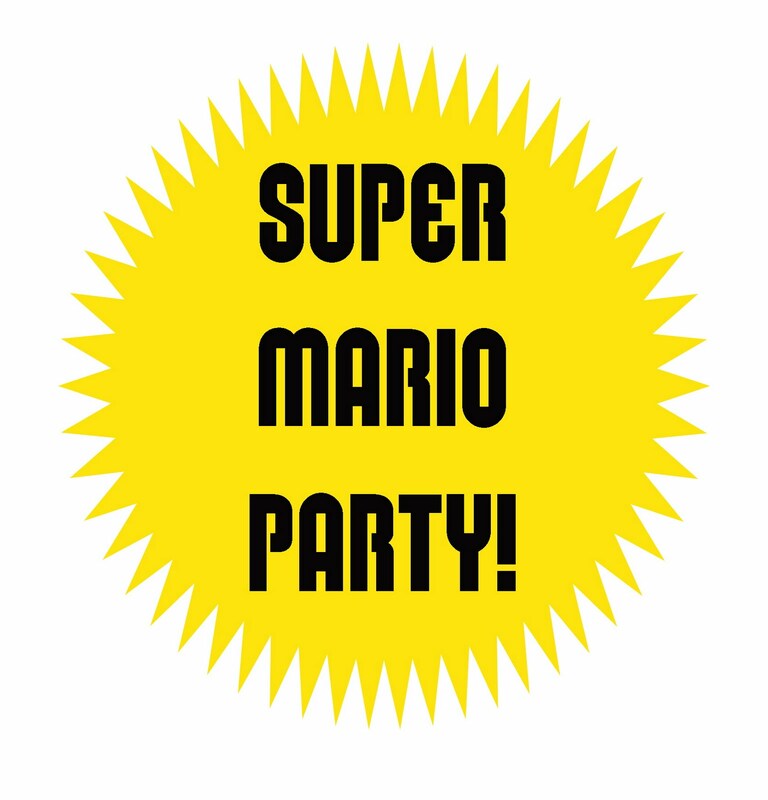 I downloaded a Mario inspired free font for the question mark on the box. (For those clueless Mario readers...if you're still reading...these are supposed to represent the question mark boxes that Mario breaks in the game to find surprises.) If I would have known about the font earlier I would have used it for the invites too. I printed the ? 's, then cut, and glued them to the boxes. 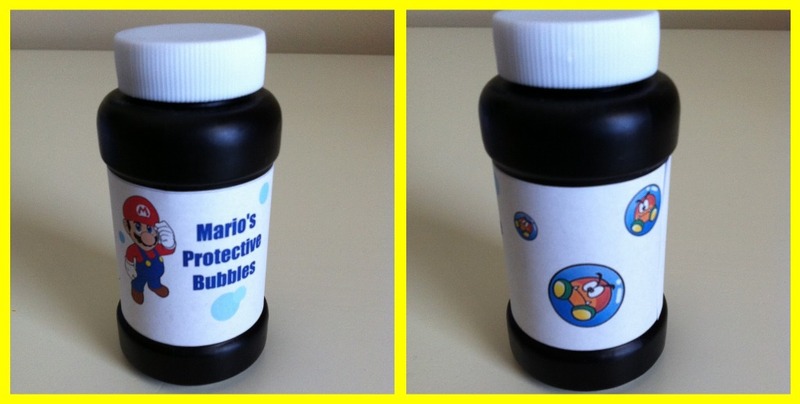 In one Mario game the players hang out in protective bubbles at times, so there you go. Protective Bubbles. I bought bubbles, took the label off and created my own. I printed these out and simply used a glue stick to adhere. I could have gone with something fancier like double stick tape, but again, it's just going to get dripped on and thrown away. I have a thing for fake moustaches and was happy that they fit into the theme. I ordered the mold online and made chocolate lollipops. 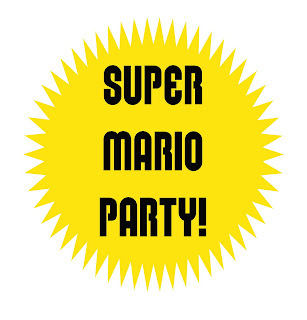 The party store carried minimal Mario favors. Vance chose the pencil case and stickers to go along with the bubbles and lollipop. So there you go, a homemade Mario party. This was Vance's first friend party and I felt it was a success. you did a great job creating your own party favors. 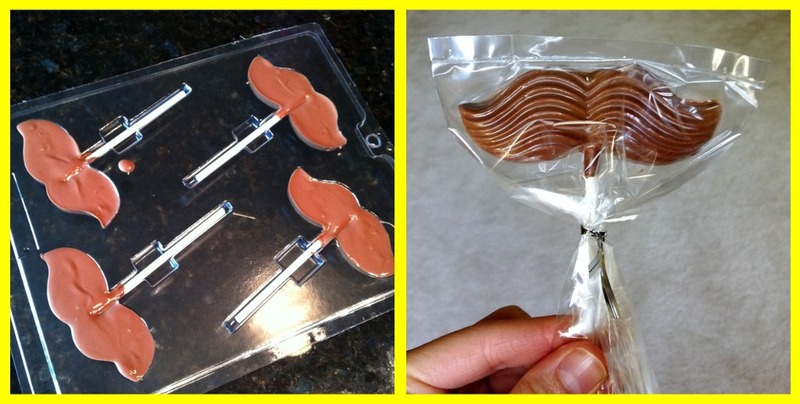 Love the mustache pops! Vance must have been so proud of his party. Everything looked absolutely awesome. Wow I am impressed! I hope he and the kids enjoyed every bit of it. What a cute idea! My son would've loved this when he was younger.